Plantation Oaks Farms is one of the oldest working farms left in Florida. It is part of the Mizell-Hodges Estate in the quiet town of Callahan, Florida. 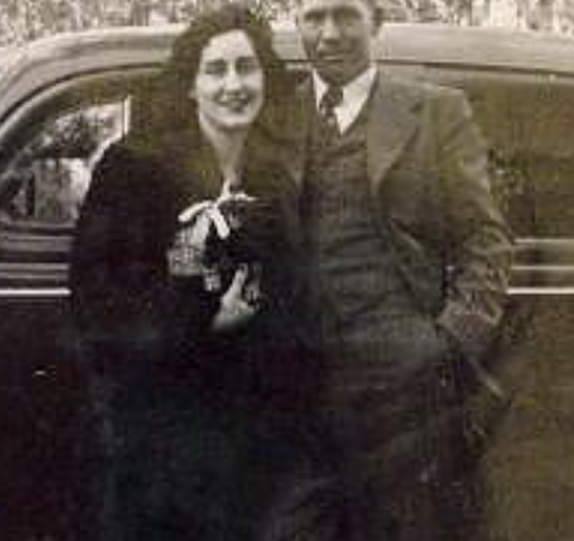 In 1933, the farm was purchased by the current owner's great-grandparents, Walter and Helen Hodges. In 1935, their daughter Jean Hodges was born, the current owner's grandmother. Walter, Helen and Jean were a small family of three but all were full of the love of thousands. In 1948, Walter and Helen's lives were forever changed when 13 year old Jean met 17 year old Dorman Mizell at the school carnival. 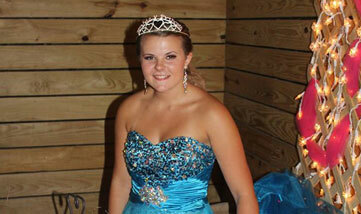 Jean was the carnival queen and Dorman wasn't about to let this pretty girl slip away. Despite Helen's hope that Jean would continue onto college, she married Dorman Mizell just after her 18th birthday in 1953. Dorman and Jean had four sons who were all born throughout the 50s and 60s. During this time, Walter Hodges passed away from cancer. Dorman Mizell took over the farm from the 1960s and continued to work the hatchery and raise chicks into the 1980s along with his sons. In 1983, Hollywood came calling and wanted chickens from the farm to be used in Jackie Gleason's upcoming sequel "Smokey and the Bandit Part 3." Over 300 chickens were used in the movie which was being filmed in Fort Lauderdale. In the 1990s, Hodges Poultry Farm was bought out, like so many other small family businesses. In 1999, Walter & Helen Hodges great-granddaughter, Amy Mizell, took over the north eastern half of the farm and began building her dream horse farm. After attending college at Texas Tech University and Auburn University studying Animal Science Business, she returned home with her degree in 2005 and expanded into horse boarding, training, and raising Paint horses with the help of her maternal grandfather, Charles Brooks. She met her husband, Kevin Green, in March of 2007 and they married in March 2008. They welcomed their first and only child, Colt, in June 2009. After briefly leasing the farm out in 2012 to focus on her son, Amy took the farm back over in 2013 and renamed it Plantation Oaks Farms to appeal to a wider variety of equestrians. In 2014, the farm expanded again to open the new air conditioned rustic event barn. The farm still has a lot more expansion to come in the near future. We couldn't have found a better venue for our wedding. It was absolutely perfect!!! Amy was such a pleasure to work with and without a doubt the easiest person to work with. The new bridal suite is gorgeous and a wonderful surprise after already booking the venue. Plantation Oaks was everything we hoped for our wedding and more--- down to the well kept grounds, beautiful oak trees and perfectly kept barn. Amy thank you and your staff for everything and helping to make our day so perfect!!!! This venue is beautiful and Amy and her team are beyond amazing. 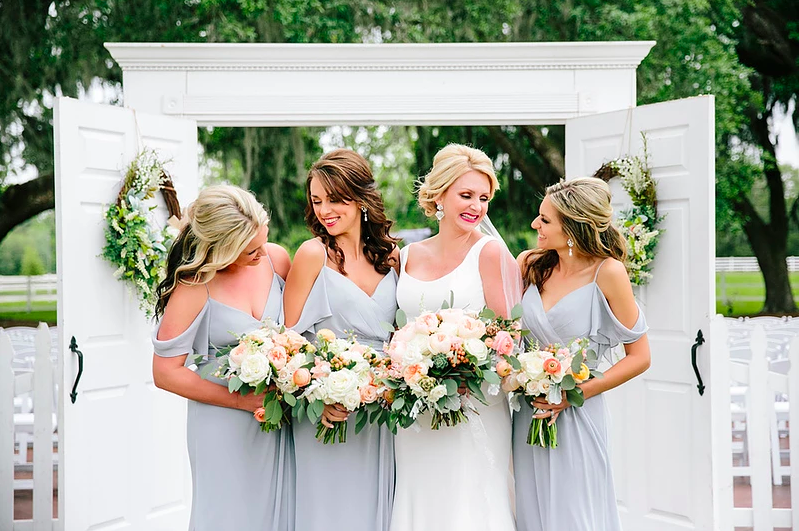 It poured on my wedding day and Amy and her team responded quickly and made my dream come to life indoors. It was so much more than I had imagined. Amy is wonderful to work with, she is professional and always available for anything you may need. It was truly a flawless event and I will recommend plantation oaks to everyone! Congratulations to our son marrying the love of his life. We now also have a daughter as well as a son. They got married after the 4th of July. This was the most Beautiful place to be Married at. The Staff went above and beyond to make sure their special day was what they wanted and went off without a hitch! Thank to all who made our son's day the most Happiest Day ever besides his children being born! 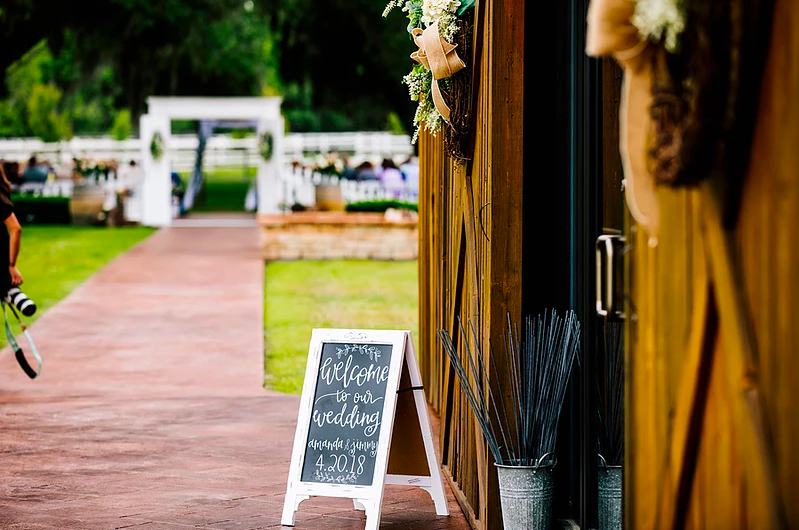 As a wedding coordinator you encounter many vendors and venue owners... and I must say Amy is by far THE best venue owner I have had the pleasure of working with. She and all of her staff are professional, courteous, and extremely helpful. 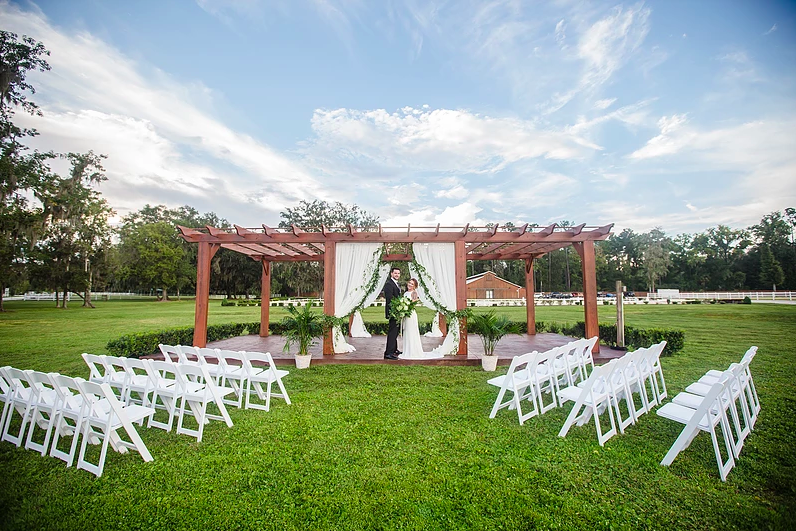 The transparency of all the policies truly sets this venue apart from any other venue in the North Florida area. 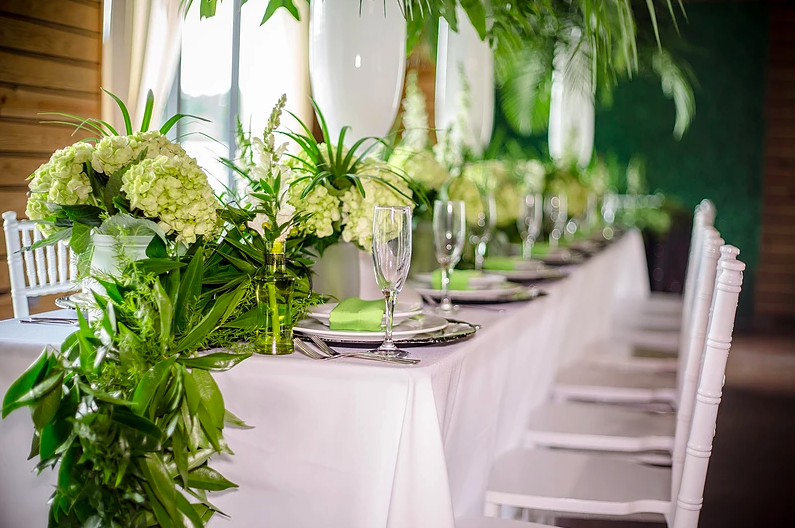 From the initial wedding meeting to the floor plan layouts, email recaps, and the venue management, I have never been more excited to recommend a venue to everyone I meet because it is easy to host a flawless event when you have a venue of this caliber. Oh! Let’s not forget the beautifully maintained space and the layout of the farm surroundings/animals. I highly recommend this venue, not just for weddings, but for any occasions. Give yourself and your guests an experience! 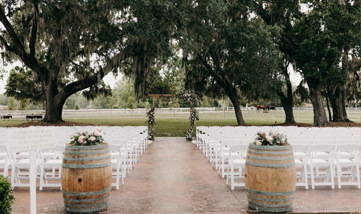 You can choose to hold your wedding at one of our two ceremony sites – the Pergola with the Event Barn as the backdrop or the Oak Lawn which faces to the west under our 200 year old live oak trees draped in Spanish moss. This puts them in the ideal position to capture the beautiful red, purple and gold hues of the beautiful sunsets we experience daily at Plantation Oaks Farms. 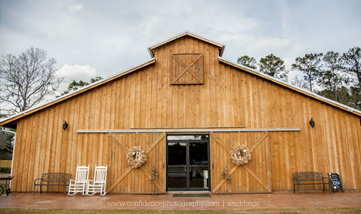 Receptions are held in our air conditioned Event Barn. We are more than just weddings. 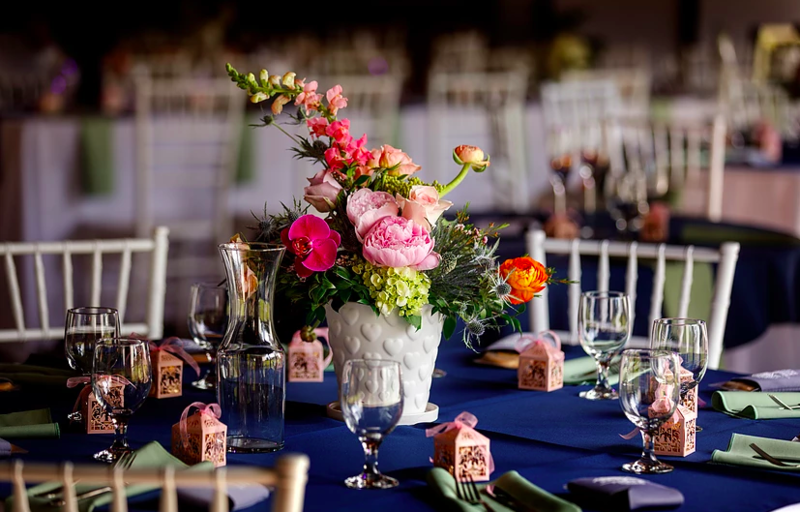 Our event Barn can accommodate any type of event – a Sweet 16 party, baby shower, graduation party, prom, bridal shower, anniversary party, corporate meeting, family reunion, class reunion, birthday, quincenera, bat mitzvah, company party, holiday party, athletic banquet and more!